THE 180: What brought you to work in education? MR. ARGUETA: I came from limited means. I’m the son of two immigrants who just tried to give me a shot. My parents firmly believed that education was the path that would lead me to something better. A friend told me about the New York City Teaching Fellows. I decided to take a chance and try to fulfill a dream that I had in my heart for a long time. THE 180: How do you approach a typical day? MR. ARGUETA: As soon as I wake up, I give thanks. I realize the power of self-healing and the power of self-care, and how important it is when you’re working in education. You truly are sharing yourself with these children and with your colleagues for the betterment of all, so that we can all move forward as a school. As soon as I walk into this building, I realize that my job here at this school goes far beyond teaching reading, writing and math. THE 180: How have you developed your teaching practice? MR. ARGUETA: I had some very valuable mentors placed in my path, some of which I found here with the school, some of which I partnered with through Turnaround, like Mr. Scott. Being open to feedback is probably the biggest thing. Realizing that different perspectives are going to offer you new dimensions in how you approach your work. Once you realize that you are working with little human beings that deserve the same amount of respect that you would give any colleague, that you value their input as much as you would any educated adult, then you really begin to connect your soul with a student in a way that — you can’t argue with the results. Students come in and they know that they’re ready to learn. I believe if we empower students to believe in the power of education before we teach, then lessons are much more effective. THE 180: What has your experience with Mr. Scott been like? 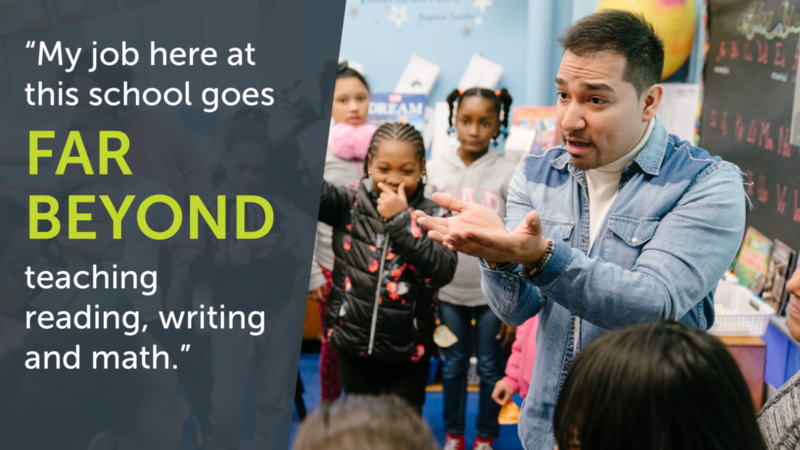 MR. ARGUETA: He has a very welcoming spirit, and it connects with mine. It’s a mirror. We just started off with small conversation. Eventually, he would trickle into the classroom, taking on the role of an observer. He always approached me after class and asked me if I would be open to feedback. It was never given without warrant, and, honestly, having that open ear is what I attribute a lot of my success to. It’s always constructive. As soon as I started to hear Mr. Scott speak — it’s just a voice that you’re mandated to respect, because he speaks with such conviction and such knowledge behind what he does. He sits down with me and we reflect on how a lesson might have gone. He’s an extra set of eyes — “Have you noticed this?” Taking on the role of a mentor, it’s something that you don’t really get a lot, because in this field, it’s very hard to sit down and actually have time to talk to a colleague. He’s an ear that is always around for me to ask him how to better the practice. It’s just been awesome. THE 180: Have you seen your work with Turnaround having an impact on the school? MR. ARGUETA: Absolutely. I remember when Turnaround first came into the building, we talked about the importance of a morning meeting. Mr. Scott gave the science behind it and the statistics of how it’s worked in other schools. That is something the whole school community has wrapped themselves up around. They’ve gotten behind it, and it took off. Across the school, teachers are seeing the importance of morning meeting: coming in and taking a quick assessment of how children feel before you put a book in their face. Because when you live with a lot of trauma and you have people at home that are hard on you, if you come into a school building and you continue that process, it can be extremely damaging for a child. Starting your meeting in a way that builds community is something that Turnaround has brought into the P.S. 32 community. To me, that is invaluable. THE 180: P.S. 32 serves a number of students who arrived at the school after leaving the Dominican Republic or Puerto Rico in the aftermath of damaging hurricanes. What have you learned about helping children who have experienced this level of trauma? MR. ARGUETA: We have a lot of students that are migrating from other countries. And, unfortunately, now the school has seen an increasing number of students who have suffered trauma and come with a story where something has occurred at the border. They have either been separated from their family, or they’ve had a very strenuous migration experience. You have to take the time as a human being to wrap your arm around a child and say, “Listen, it’s a safe space. I understand that you’ve gone through a lot.” When you do that directly from your heart, I believe that you connect with a child in a very special way. It sounds simple, but that is the practice that I exercise every day. I don’t believe in inequality when it comes to the role of teacher-student. I try to empower my students. I tell them all the time, “There is not one teacher in this classroom. We have 33 teachers. Because we’re all learning from each other.” When you give a student who has gone through such a tough migration process that sort of power, then they realize that there is value in what they’ve brought from their country. It opens them up to just wanting to share and feel open and connect with people from all walks of life. THE 180: Was there a relationship in your childhood that was fundamental to your success? MR. ARGUETA: Ms. Schoenfeld was somebody who, when you came into school, you knew that you were going to receive a smile. You knew you would receive a compliment that would somehow change your day. She always encouraged us to explore our dreams, whatever they were. I had her three different times, in kindergarten, third and fourth grades, which mirrors what I’ve gone through, because I started off as a third-grade teacher, was asked to loop-up with my kids, and I am now their fourth-grade teacher and may have them again for fifth grade. Ms. Schoenfeld was constantly teaching me about what it means to be a member of the community in the class; things that I never lost, even as a high school student. And boy, did I go through my troubles in high school. I think that allows me to connect with students, because it allows me to come from an authentic place. I did not grow up with a lot. I see myself in a lot of these children. I understand what it’s like to be in their position, but I also have the benefit of understanding where it can lead. I realize that I have been gifted an opportunity to truly be a teacher that these kids remember. I don’t want to waste one second. THE 180: Is there something you want people to know about being a teacher? 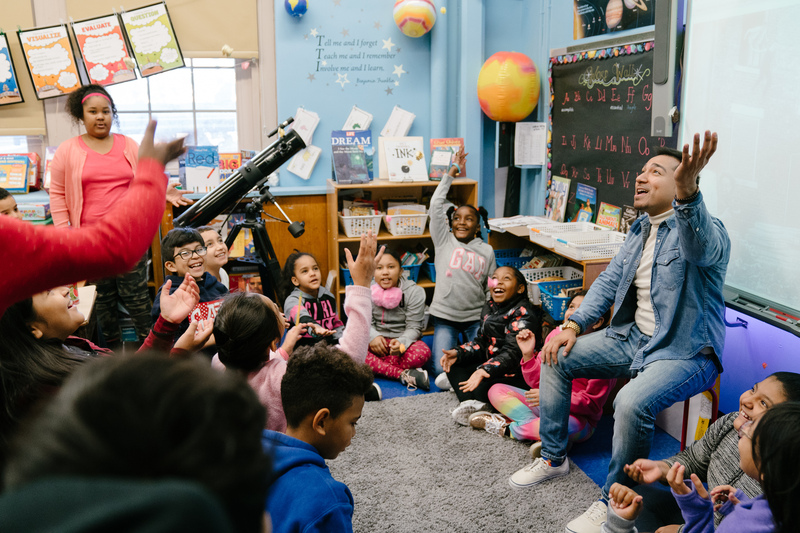 MR. ARGUETA: I think as teachers, we’re always heavily focused on the child’s future success. We always concern ourselves with preparing them for an exam or preparing them for the next grade. And I think because of that we tend to overlook that a child is still very much a person in the present moment. I think we as teachers can become robotic and go through our daily motions. Because, of course, we still have standards and goals that we want our students to meet. But I don’t believe that we should get bogged down only by that. Accepting a child holistically, and understanding that we have to teach them holistically, is extremely important. Without getting too spiritual, I do believe that we do God’s work when it comes to teaching others. When it comes to exercising kindness and being kind to your neighbor. And that is why my classroom functions more like a family than a room of 32 students from different parts of New York City. It’s very much a tight-knit community and it’s because everybody in this class values the person who they are in the present.